America’s 239th birthday is just around the corner – how will you be celebrating? 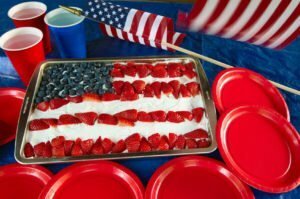 We recommend fixing up this delicious 4th of July cake recipe to impress your friends and family at the Fourth of July BBQ. Heat oven to 350 degrees F and bake the cake based on the directions on the box. Use a 13×9 inch pan and cool the cake for an hour before continuing. Frost with the whipped vanilla frosting and get creative! You will want to design your cake to resemble the American Flag, so start by arranging the blueberries on the top left corner of the flag to mirror the stars of the flag. Then, use the sliced strawberries to resemble the stripes of the flag. We hope you enjoy this 4th of July cake recipe! Contact Pierce Insurance Group in McKinney for all of your Texas insurance needs.